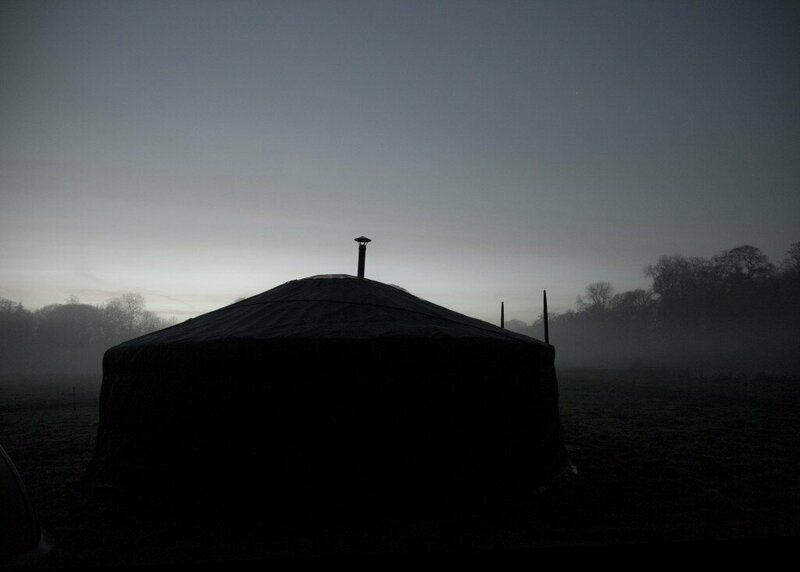 From May to October 2014 Barnaby Hosking decided to set up camp in a Mongolian yurt in the English countryside. Within the Houghton Estate in Norfolk, by a lake and a huge oak tree, he made artwork and lived a simple life under the guise of an “Ornamental Hermit”. Word would slowly go around that there was an artist living on the field. People would come around, look at the paintings, have conversations. Life would be slow and quiet. On his return to London, this self-imposed hermit like residency inspired new works for the upcoming “Habitat” exhibition at Gallery SE8 on Deptford High Street. The yurt is still in its original location, visited every fortnight for inspiration, quiet time and to light the stove. Another of the artist yurts will be re-erected in the yard of Gallery SE8 in which Barnaby will be talking about his artwork, experiences and the problematics of mobility, from rural to city, from residency to studio to gallery. Spaces for this one-off talk are limited, so please let us know if you are planning to come. at SE8 Gallery, Deptford, London. Hot soup and drinks are being served. The Haystack coincides with Barnaby’s exhibition “Habitat” at SE 8 Gallery. SE8 Gallery is pleased to present the exhibition ‘Habitat’ by the British artist Barnaby Hosking. The new works include a full-sized Kazakh Yurt built outside, and an installation in the gallery that features a sound score of field recordings. Both internal and external spaces function as immersive, hermetic environments and underscore Hosking’s concern with space as lived experience, when ‘no apparent form ever becomes complete but is in a constant process of movement’. The installations at SE8 Gallery are a direct result of the artist’s embedded experience in the landscape, and comment on the problematic of mobility: from studio – to site – to gallery. 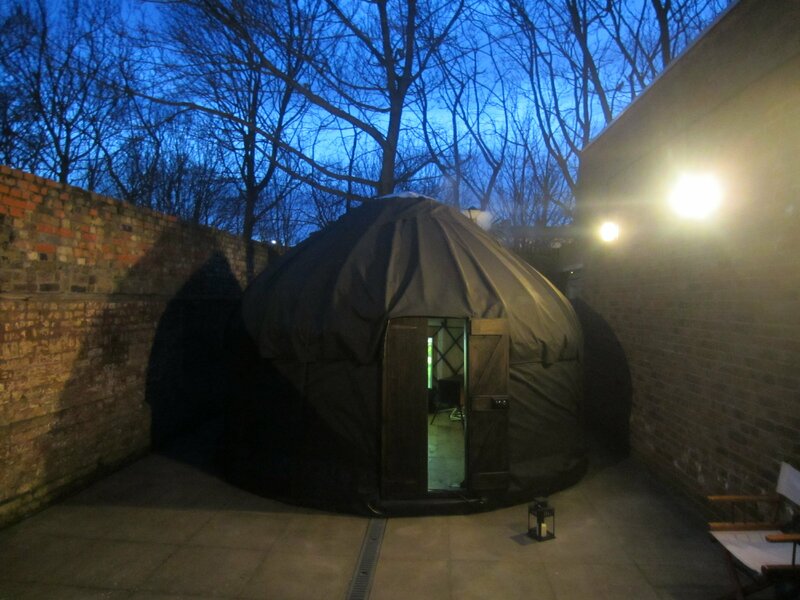 In the late Spring of 2013 the artist constructed a Yurt in the grounds of the Houghton Hall Estate in Norfolk, where he would live until the Winter. Here, the artist presented himself as a modern-day hermit, ensconced in his mobile dwelling. During this period of solitude, he was not especially concerned with representing his surroundings, preferring to show the evidence of the individual’s actions within it through experimental paintings, photographs and field recordings. Instead, the true subject of the adventure was the artist ‘s presence, his embodiment of spatio-temporal perception.